Carmen Aguilar y Wedge is the co-founder and director of creative technology for Hyphen-Labs. She modeled the company's ScatterViz visor at the Sundance Film Festival in January. Countersurveillance fashion designs are being spotlighted at this year&apos;s South by Southwest conference in Austin, Texas, by a group of young women of color who started a company called Hyphen-Labs. They are scientists, architects and engineers turned artists "creating critical work for critical times," says Ashley Baccus-Clark, a speculative neuroscientist and member of the collective, which includes designers from around the globe. Clark was trained as a molecular biologist, while one of her partners, Carmen Aguilar y Wedge, used to work as a structural engineer. At the conference, they&apos;re offering participants a look at their covert fashion accessories. Their art installation begins with a virtual reality experience they call NeuroSpeculative AfroFeminism. It&apos;s a science-fiction-like beauty salon for black women that anyone can live through using VR goggles. Inside this virtual world, beauticians braid the clients&apos; hair with electrodes meant to boost brain power. "What we&apos;re projecting here is that black women are the pioneers of brain optimization," Aguilar says. Not all of their inventions are as abstract and theoretical as the VR salon, which they first rolled out at this year&apos;s Sundance Film Festival. They also showcased a small line of covert fashion products designed to protect the wearers&apos; identities — particularly for people of color. Among the fashion prototypes they showed was an incandescent sun visor. "You can put it in front of your face to deflect any malicious gaze and control your identity," Aguilar says. "Whomever you&apos;re looking at can&apos;t see in," Clark adds. "What they see is a reflection of themselves. So if they&apos;re saying something to you that isn&apos;t nice, then they&apos;re forced to view their own maliciousness in the mirror." The women also introduced oversize, hip-hop style "door knocker" earrings with hidden cameras and microphones. Clark says they could be useful during police stops "to begin recording any sort of altercation or ambiguous interaction at the touch of a button." She says this is meant to put power in the hands of the person wearing the earrings, in an age when police are wearing body cams and using dashboard cameras. 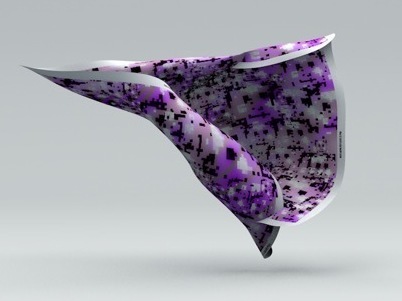 Hyphen-Labs also unveiled a purple and pink silk scarf that camouflages the wearer from facial recognition software — the kind used by social media, online retailers, law enforcement and the military. The scarf&apos;s fabric is designed with 1,200 pixelated faces meant to mislead computer algorithms. "We&apos;re looking at like, what if people were to wear this to protests?" Clark says. "When you have so many faces on a garment, you can ultimately, if enough people are wearing it, break the surveillance system entirely." The so-called HyperFace scarf was designed by Adam Harvey, an American artist living in Berlin. "The idea here is that you&apos;re misleading the face detection algorithms by providing false positives," he says. "And the way that would work in practice is if you&apos;re able to reduce the confidence score of your true face, then you blend into the background of fake faces." A few years ago, Harvey began working on designs like this when he was a student at New York University. Now, he has a whole line of nouveau camouflage, including what he calls stealth wear: anti-drone burkas and hijabs. They&apos;re made from textiles fabricated with silver, which makes them very expensive. They&apos;re meant to thwart thermal-detecting drones and spyware. "If you introduce a barrier between your body&apos;s radiation of heat, which is equivalent to about a 100-watt lightbulb, then you disappear," Harvey says. "So it&apos;s a little bit magical. I wouldn&apos;t go so far to say that it&apos;s a Harry Potter cloak, which people seem to really want it to be sometimes." Harvey says a 99-cent Mylar blanket could do the same, but isn&apos;t nearly as fashionable. He is now working with Hyphen-Labs to come up with even more covert designs.